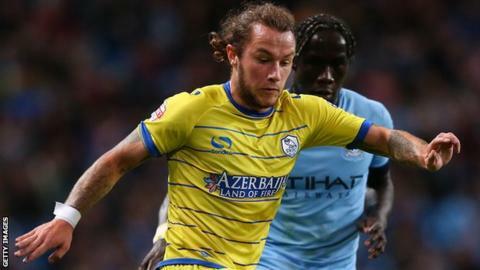 Sheffield Wednesday's Stevie May and Sporting Lisbon's Ryan Gauld have been called for Scotland's forthcoming Euro 2016 Group D double-header. The Scots resume their attempt to qualify for France in 2016 when they play Georgia and Poland next month. May has scored three times since arriving at Hillsborough, while Gauld was recently included in Sporting's Champions League squad. Celtic captain Scott Brown returns to the squad following injury. Former Dundee United midfielder Gauld, 18, has previously represented Scotland at under-19 and under-21 level, while former St Johnstone forward May has eight under-21 caps. "They're just good young players," Scotland manager Gordon Strachan said. "I've seen them from afar and I like to see how they deal with the squad, I like to meet these young players that I'm sure in the future will make an impression and will be regulars in the squad. "What you've got to do when you come along with us is give yourself up for this group of players. "You might want to play a certain way but when you come here we've got a couple of ways we want to play and if you can fit into that system then that's great. Some players out there, at this moment, can't fit into the system." Strachan said he may call up a third young player, depending on injuries and call-offs. The first of the Group D double-headers against Georgia will be played at Ibrox on Saturday 11 October, then Scotland travel to Warsaw for a midweek encounter with Poland on Tuesday 14 October (kick-off 2045 local time). And Strachan is delighted to have Brown back in the fold after the Celtic captain missed the 2-1 defeat by Germany in the Group D opener. "Ask any manager who's had him how important he is to have about the place," Strachan said. "Not just his playing ability, which is fantastic, but just to have him about the place - he radiates." Celtic midfielders Callum McGregor and Charlie Mulgrew drop out of the squad, the latter having picked up a knee injury, along with Wolves midfielder Kevin McDonald. Aberdeen defender Mark Reynolds keeps his place after getting a late call-up for the opening qualifier against Germany.